I had no problem coming up with a list of my favorite films from the year, but I had a difficult time coming up with my absolute favorite. “Boyhood” is a remarkable achievement, besides the fact that it was a twelve year project for its cast and crew, it says something great about life and can mean something different for everyone. I was hesitant to see a nearly three hour film which, from what I had heard, doesn’t have much of a plot. It doesn’t; it’s very much full of strung together vignettes of ordinary life. But it’s oh so fascinating anyways. As the parents Patricia Arquette and Ethan Hawke are at the top of their game and even if the kids aren’t quite as seasoned, they’re rather impressive in a naturalistic way. 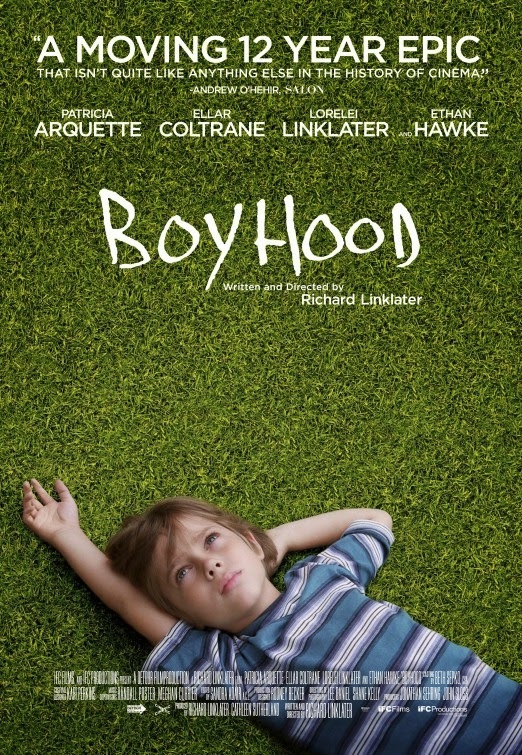 Richard Linklater has never been a favorite director of mine (this might be the only film of his I actually really like, crazy I know) though seeing at how great Boyhood makes me want to check out some of his other films. It’s definitely a must-see, once in a lifetime type of movie. Never underestimate David Fincher paired with a popular pulpy best-selling novel. 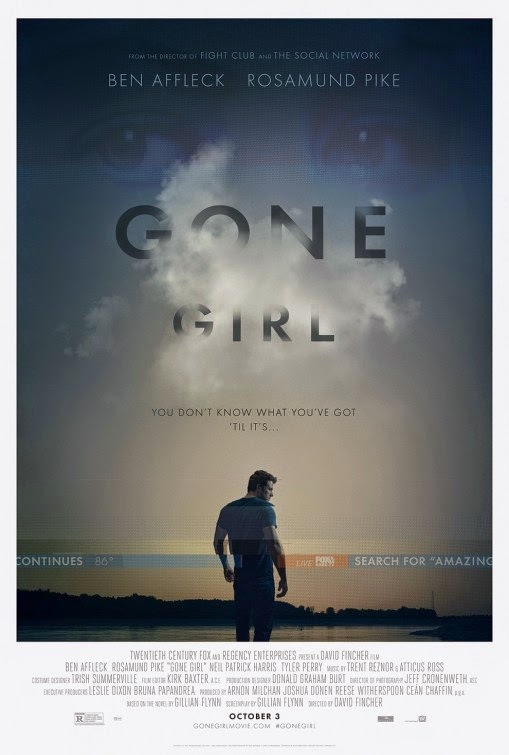 I didn’t know much about Gone Girl going in and boy was I surprised. I can’t imagine would it would be like having read the book before seeing the movie because it would have been horribly spoiled (That was my anti-reading PSA for the day). “Gone Girl” is yet another masterpiece. It’s stylish, exciting, and so twisted and fun I wish the film were even longer. Fincher and his cast and crew never give us a wasted minute in a gripping story about society’s general fascination with the media. Rosamund Pike is simply outstanding as woman who goes missing. For a movie full of secrets and shocking twists, the marketing department actually did an outstanding job selling this movie. How this movie only got one Oscar nomination I’ve never know. 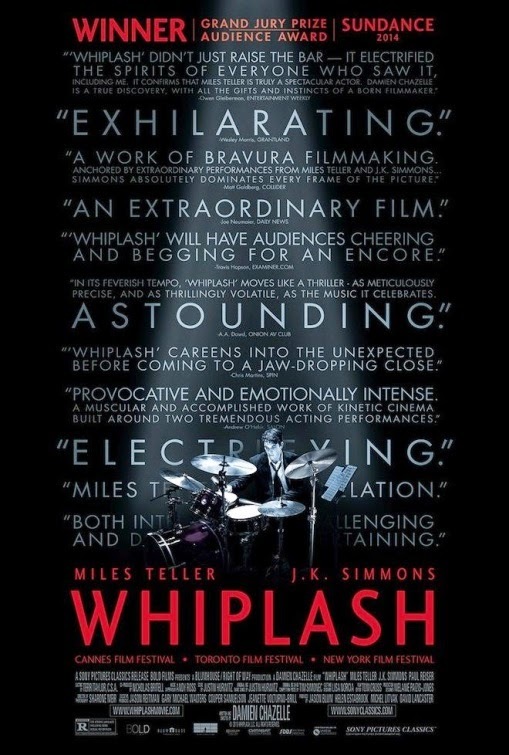 I had keep hearing about how the drama “Whiplash,” about a first year drumming student in a prestigious music conservatory, worked almost like a thriller. I thought, “Well maybe he kills someone with his sticks or something and has to cover up the crime?” No, there are do dead bodies or car chases or murders to be had in “Whiplash” but it’s every bit as thrilling. Heck, I’d even call it Hitchcockian. The way the film is shot and edited makes it absolutely suspenseful. The film is basically a game of cat and mouse between a first year drumming student (Miles Teller) and his ruthless instructor (Oscar nominee J.K. Simmons). Simmons has a rather extreme teaching style and Teller wants to be a great jazz musician. It’s an exciting, stupendously enthralling film that shouldn’t be missed whether you’re into music or not. 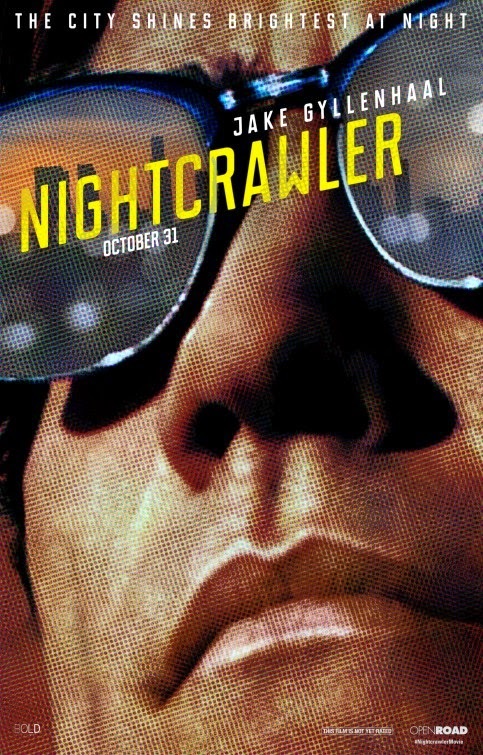 “Nightcrawler” is sort of the darker, modern cousin to “Network.” Both are about the prices people are willing to pay for TV ratings. Jake Gyllenhaal gives a performance for the ages as Lou, a creepy guy who makes a living by any means necessary. He eventually falls into “nightcrawling” a term used to describe the camera guys who go around filming accident and crime scenes for local news stations. He meets news producer Nina (Rene Russo), who is willing to put anything on the air. Moral and ethical lines are crossed as the viewer is constantly pulled into this dark, strange world. The film is a tenacious work, helmed by a first time filmmaker who is in top form. The film is thrilling from start to finish. I still think it’s sort of odd that Angelina Jolie directed a World War II epic. I also think it’s odd that I find it to be one of the most moving films of the year. It’s certainly the only film that has brought a tear to my eye. 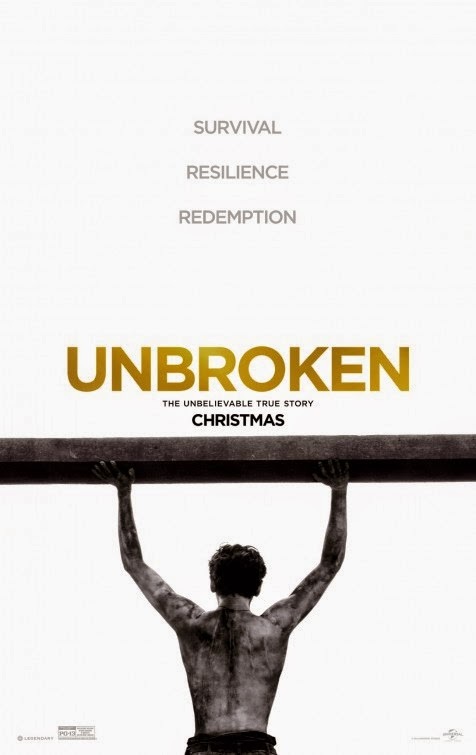 For some reason, while watching “Unbroken” I became strangely captivated by the true story of Louie Zamperini, an Italian-American Olympic athlete and Army veteran who during WW2 had to survive over a month on the ocean after his plane went down, only to end up as a prisoner of war in a Japanese detention camp. It’s a story so ridiculous and unbelievable that it could only happen in real life. Jack O’Connell is simply amazing in the role of Louie and it’s gorgeously photographed by the one and only Roger Deakins. On paper this is a film that feels like it was made to win awards (ironically, and disappointingly it was only nominated in 3 technical categories at the Oscars) but I found it to be an engrossing, beautiful, and altogether uplifting story of survival. It’s not the easiest film to watch but I was transfixed by every minute of it. 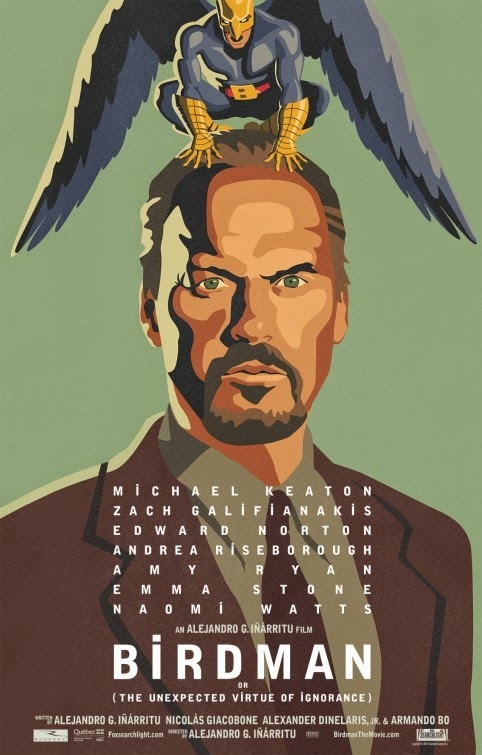 The fantastic “Birdman” is really something to behold. First off, it’s a film that only genius cinematographer Emmanuel Lubezki could have shot because it’s presented as if it were shot in one take. It’s sort of like the black comedy version of Alfred Hitchcock’s experimental “Rope.” Of course, the film wasn’t shot in a single take and it’s the genius of the film’s editor which holds that distinction. The movie tells the story of a washed up actor known for a trio of hit superhero films (a wonderful Michael Keaton in a role tailor-made for him) who decides to reinvent himself by writing, directing, producing, and staring in a Broadway play. On the brink of opening night he’s also in the midst of having a complete mental breakdown. The film features a solid ensemble with great turns by Edward Norton, Emma Stone, and Naomi Watts among others. A truly amusing cinematic experience that demands to be seen more than once. Who can complain about superhero movie fatigue when we’re giving such great films as “Guardians of the Galaxy?” The film is superb on every level. The film is less concerned with fitting in with the Marvel Cinematic Universe and more about entertaining the heck out of its audience. It has all the fun of Indiana Jones and Star Wars all in one. 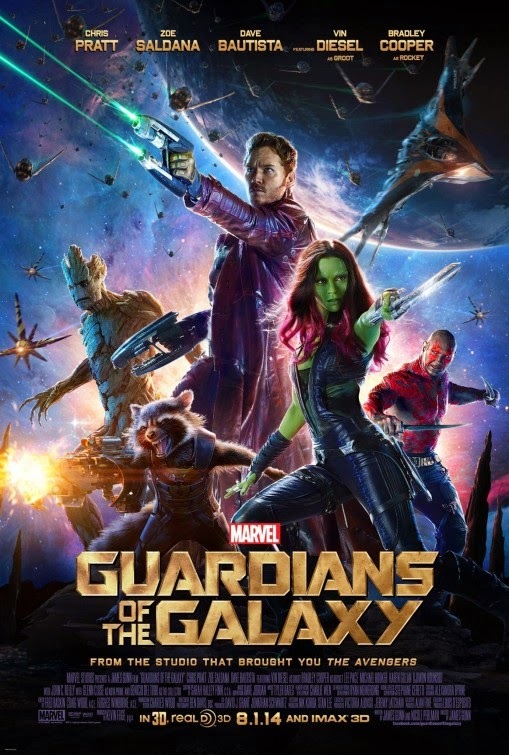 The film wisely makes the main character instantly relatable as Star Lord is a human being (played terrifically by Chris Pratt) who’s love of the songs of the 60s and 70s makes him one of the more memorable comic book characters of recent memory. He joins up with a ragtag group of intergalactic beings to help save the galaxy. It’s sheer fun from beginning to end with an intelligent and witty script, solid action scenes, outstanding effects, and one of the most memorable soundtracks in quite some time. This movie is fun with a capital F.
One of the most divisive films of the year is also one of the most memorable and all-out cinematic. The lengths Christopher Nolan takes to show us stuff we’ve never seen before is truly amazing. The story isn’t something we haven’t seen before but he really takes things to the next level. In the not too distant future, the Earth is dying and the only way to save humanity is to explore the farthest reaches of the galaxy for a new home. The film is truly remarkable and it’s on a scale that defies classification. Hans Zimmer’s organ-infused score is mind-boggling amazing and it’s matched with dazzling visuals that only someone like Christopher Nolan can give us. And he doesn’t take the easy way out either: the film’s oft contended ending is something you either go with or you don’t; it’s certainly nothing you’re expecting. 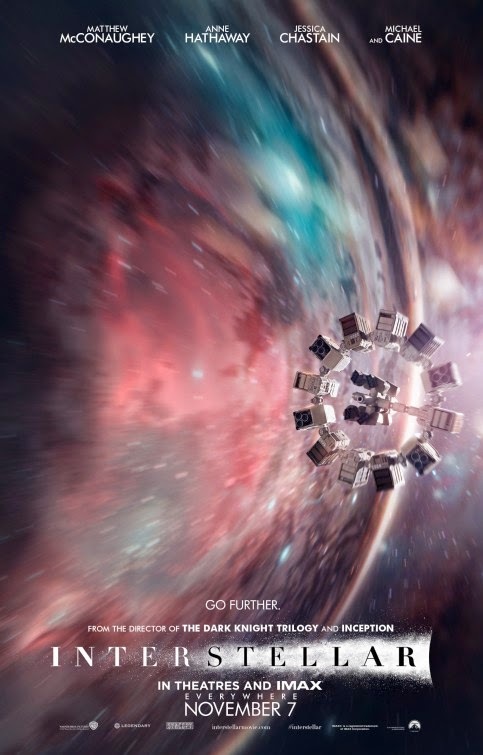 It’s a truly remarkable cinematic journey that literally meant to be seen on large IMAX screens. If you had asked me earlier this year if a movie from a Korean director would be one of my favorites of the year I’d say you were crazy. Of course, it’s a (mostly) English-spoken film with a strong foreign film weirdness to it that somehow works. It’s the story that’s truly fascinating: in the future, the survivors of Earth’s global warming crisis are forced to live aboard a non-stop train that circles a snow-covered Earth. A class system has developed aboard the train with the poor tail people eventually leading a revolution. This stylish sci-fi thriller features cool effects and outstanding production design. Also, a standout is the ever weird Tilda Swinton playing one of her strangest characters; she could be Effie Trinket’s crazy cat lady aunt. Familiar faces show up including Chris Evans, Octavia Spencer, John Hurt, Jamie Bell, and Ed Harris in one the year’s most flat out entertaining and bizarre films. 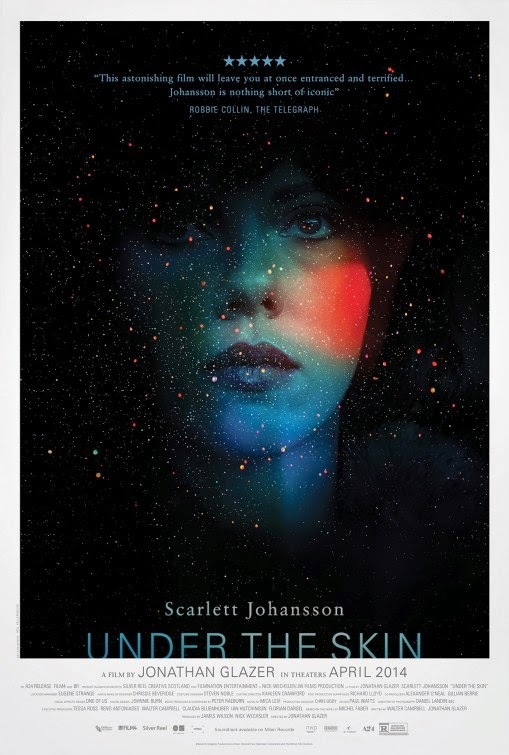 Speaking of bizarre films, is there anything more downright weird made this year (or any year) than “Under the Skin?” I didn’t know what to even make of the film on first viewing. The film stars Scarlett Johansson as an alien who is sent to Earth to seduce and kill men. I think. That’s the easiest way to describe it. The film is of note in that there is nary an instance of exposition. You have to glean from the film what it gives you. You have to piece together the characters and story. Sure, it’s a lot of work but it’s worth it. The film’s ultrarealistic approach (even utilizing the hidden filming of unaware passerbys) is juxtaposed with some of the strangest images ever put to film. Johannson is revelatory in this truly original fish-out-of-water tale. It’s like some strange mashup of David Lynch, Stanley Kubrick, and David Cronenberg. It was a movie I couldn’t stop thinking about… and then days went by, and I still couldn’t stop. Oh, and that score. Geez that score. Don’t watch Chef when you’re hungry. This simply delightful concoction from writer/director Jon Favreau is sort of like a live-action Ratatouille. Favreau is a restaurant chef who, after a bizarre confrontation with a food critic, goes out and starts up his own food truck company. Perfectly shot sequences of food being prepared and eaten follow in one of the most charming and fun movies of the year. At this point Bennett Miller is a forced to be reckoned with. He’s only directed three films and they have all either been nominated for best picture (Capote, Moneyball) or he’s been nominated for Best Director (Capote, Foxcatcher). He also apparently likes one word titles. Foxcatcher is a fascinating docudrama about eccentric billionaire John Du Pont and his bizarre relationship with wrestler Mark Schultz and his brother David which eventually leads to tragedy. Steve Carrell gives an explicably disturbing performance, but the real standout is Channing Tatum as the introverted wrestling star. 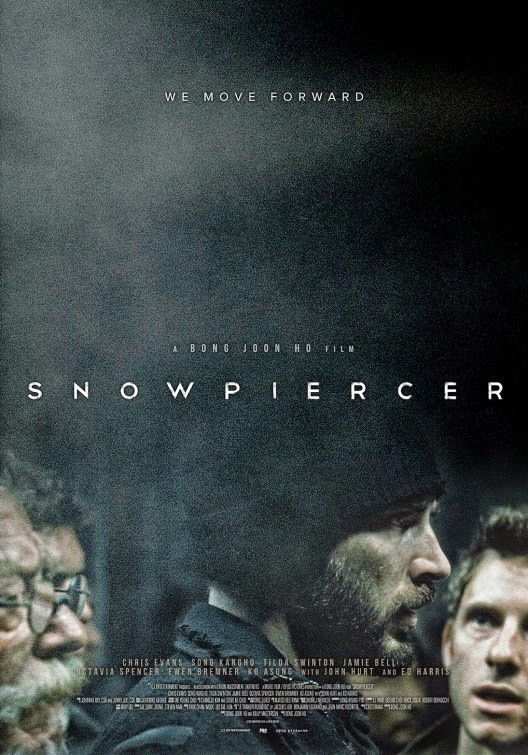 A slow-building, cold psychological thriller. There was no bigger surprise this year than Edge of Tomorrow. When the trailers hit, this seemed to look like any other Tom Cruise sci-fi action thriller. It looked like Aliens meets Groundhog Day. But then everyone saw the movie and was blown away by it. Emily Blunt and Cruise make an amazing team, the design of the aliens is fantastic, and the film is the epitome of fun. See it. This moving documentary about late critic Roger Ebert failed to gain an Oscar nomination but that doesn’t take away from its delightful brilliance. Documentarian Steven James (Hoop Dreams, which was one of Ebert’s favorite films) followed Ebert around for the past few years during the days of his deteriorating health following emergency surgery from throat cancer. We see Ebert, who lost his ability to speak after most of his jaw was removed, as he prepares for recovery. This is juxtaposed with his entire career as a film critic, film lover, and even screenwriter – we get to see the ups and down (and even fights with his late co-star and frenemy Gene Siskel). It’s a terrific documentation of a beautiful, admirable person’s life and a must-see for anyone who’s obsessed with movies like Ebert was. The first of many comic book films that were released this year and it surprised many, myself included. What made the first Captain America so great was its World War II setting and style. To me, the film resembled The Avengers without the Avengers. Boy was I wrong. Captain America: The Winter Soldier is a stylish and taut action thriller. It’s arguably one of the best Marvel films and certainly one of the best comic book films of recent memory. Can’t wait for the next one. Notice how you can’t describe The LEGO Movie without mentioning that it’s awesome? Because it is. This funny, clever animated hit, which quickly permeated everyone’s pop culture subconscious with its witty humor and disturbingly catchy tune “Everything is Awesome” is the Toy Story for today’s audience. There’s no description that can do this sometimes bizarre, sometimes frenetic, always fun, piece of pop art justice. If “Under the Skin” is the weirdest movie I’ve ever seen, then “Enemy” is the second weirdest. This strange thriller, from the director last year’s “Prisoners,” is an Alfred Hitchcock/David Lynch hybrid of strange but fascinating proportions. Jake Gyllenhaal is a regular joe with a boring life, but he likes movies. After renting a movie he’s never seen before he notices an actor in it who is his spitting image. He decides to track the guy down and confront what seems to be his long lost twin. This is a weird, trippy movie that is surely not for everyone (and it makes for a great double feature with equally bizarro “Under the Skin”) and it features probably the most shocking, random, and downright scary ending to a movie I’ve ever seen. I wouldn’t say 2014 was a banner year for the horror genre but there were a few shining moments here and there. One of which was the little seen Australian thriller “The Babadook.” The story concerns a single mother dealing with the recent death of her husband and trying to raise her trouble young son alone. The Babadook is a creepy character from what appears to be the most disturbing children’s book ever written and how he begins to sort of become part of this woman and her son’s lives. It sort of reminded me of “Wes Craven’s New Nightmare” in a way and it definitely worth checking out for horror fans everywhere. An underrated superhero film unjustly ripped to shreds for some reason, “The Amazing Spider-Man 2” is even better than the first one (but “Spider-Man 2” remains the ultimate Spidey flick) as it features terrific performances (with such good chemistry between Emma Stone and Andrew Garfield that it’s literally electric), outstanding special effects, and a pulse-poundingly awesome Hans Zimmer score. Many thought the film was overstuffed with villains, but I thought everything was perfectly balanced; this is definitely no Spider-Man 3. Reese Witherspoon hasn’t been this charming since winning an Oscar for 2005’s “Walk the Line;” so it therefore makes sense why she’s nominated again. “Wild” is another terrific true life story from the director of last year’s “Dallas Buyers Club.” The film is full of great performances, though Reese is alone throughout most of it, and the movie’s fragmented narrative is a delightful journey of redemption.